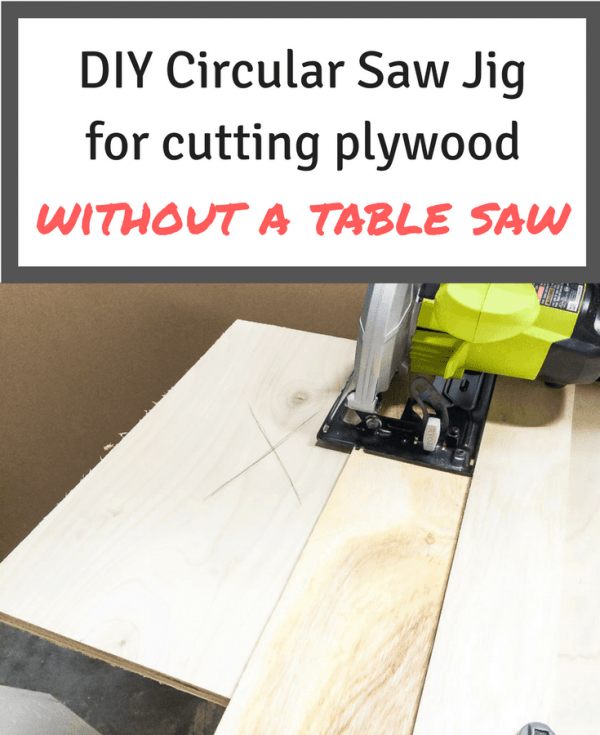 Make this simple circular saw jig and every cut will be perfectly straight! Just clamp the jig to your board and slide the circular saw along the fence. 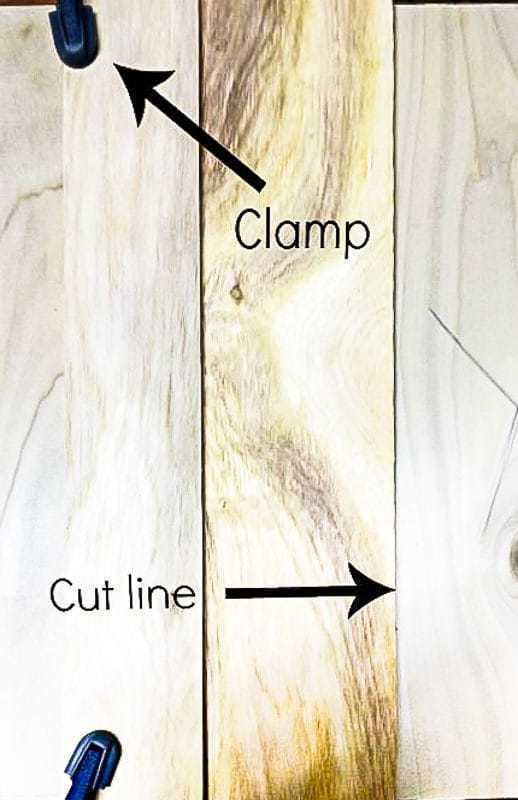 Cutting a piece of wood in a straight line seems simple enough. Just follow a line with the blade of your circular saw, right? But as you work your way down the board, the saw takes on a life of its own and you end up with a wonky edge. 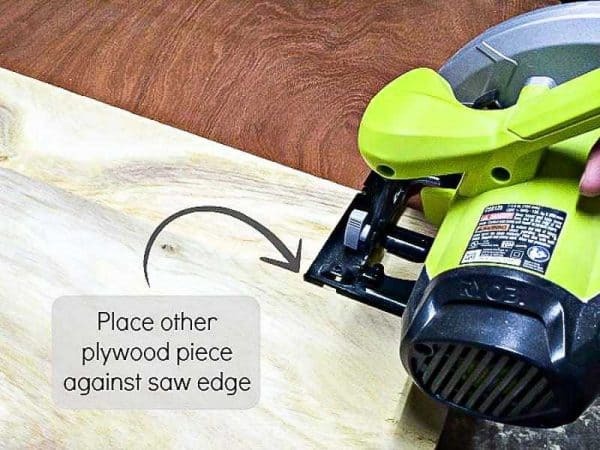 By using a simple DIY circular saw jig, you can ensure that your cut will be straight and exactly where you wanted it. This post contains affiliate links. See my Disclosures page for more details. There are several rip cut guides for circular saws on the market, such as the Kreg Rip Cut or the new Accu-cut. But if you’re just starting out with woodworking, the cost can be prohibitive. Inexpensive guides such as this one have a tendency to bow out in the middle, resulting in a less than straight cut. I own both the Rip Cut and the cheaper version, and I still go back to this very simple circular saw jig I made in my beginner woodworking class. 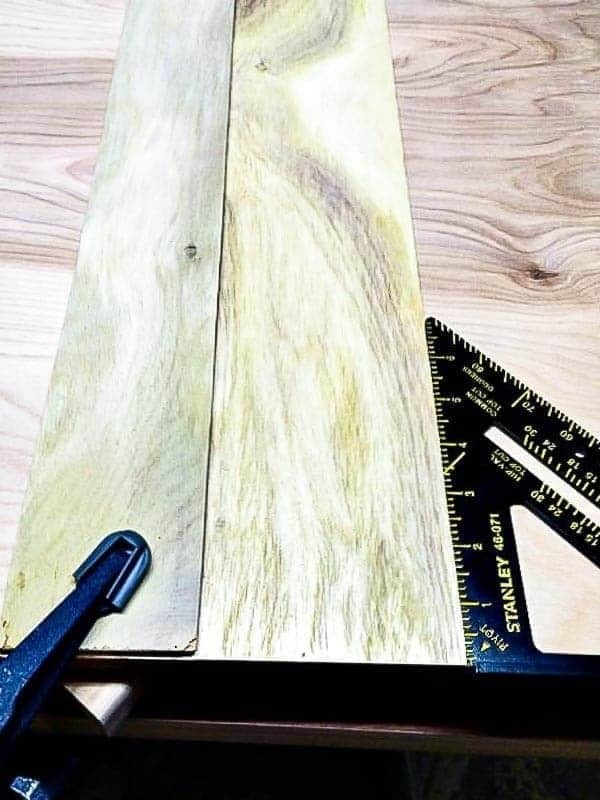 Cut the plywood sheet into roughly one foot wide strips. There’s no need to be exact. Just make sure that one piece is a few inches wider than your circular saw, including the motor. With the saw unplugged, lift the blade guide up so that the blade is exposed. Place the saw on the larger piece of plywood, matching up the edge of the wood with the side of the blade. Line up the other piece of plywood next to the edge of the circular saw base plate. Remove the saw, then draw a line where the two plywood pieces overlap. Remove the top board, and drizzle wood glue all over that side of the board, leaving about an inch clear of the line. 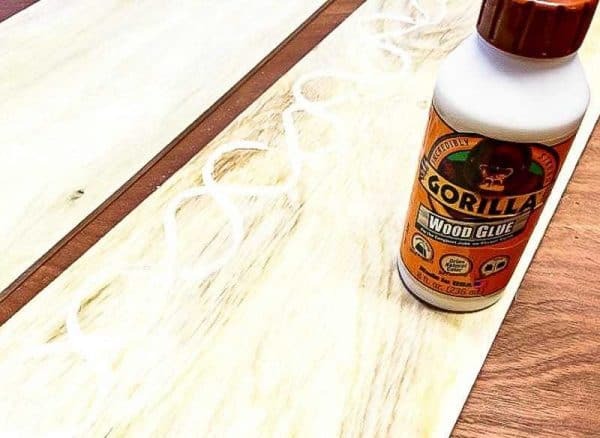 Place the top plywood piece onto the glue, setting it about 1/2 inch away from the line you drew (towards the glued side). You’ll see why later on. Clamp the pieces together, or place something heavy on top, and let the glue dry. You’ll notice that the bottom of the circular saw jig isn’t even. 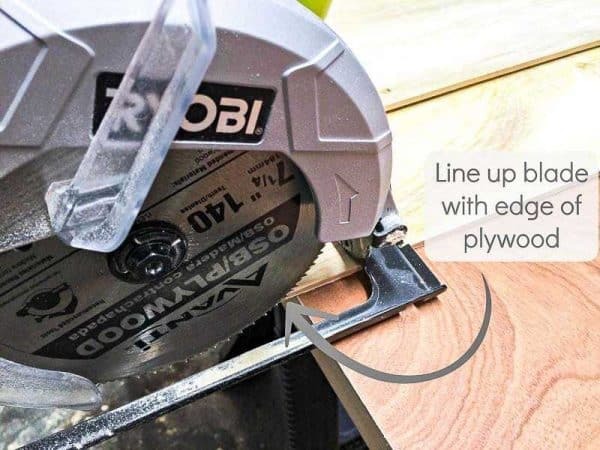 Once the glue is dry, flip it over and trim off the excess with your circular saw. Don’t worry if the edges don’t exactly line up. You can sand it down later. Every circular saw has a very slightly different width between the edge of the base plate and the blade, even among identical brands. In my beginner woodworking class, the instructor numbered every circular saw and its corresponding jig. Mixing up the saw and the jig would result in a cut that was slightly off! 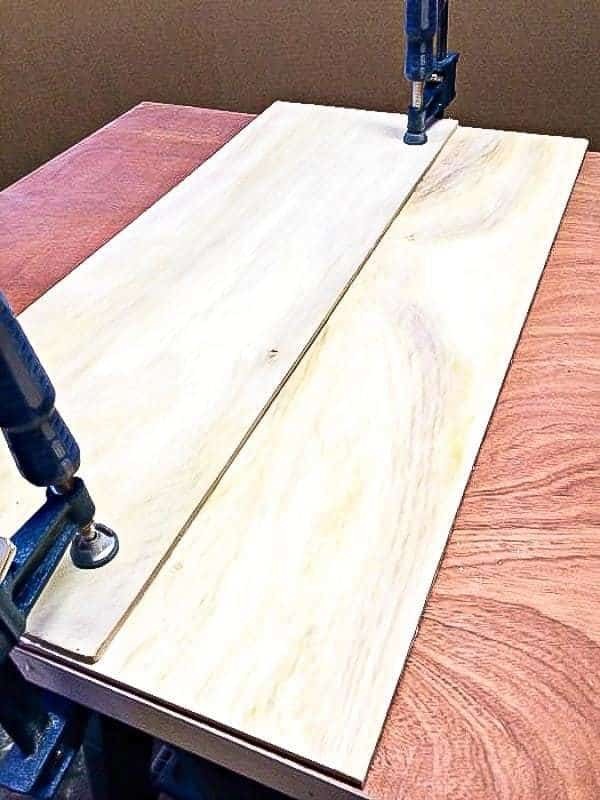 Clamp your jig to your work surface, making sure to elevate it with a few scrap pieces of wood so you don’t cut into the table. Line up the edge of your saw’s base plate with the fence you created, then cut away the edge of the board. Congratulations! You have two pieces of plywood glued together! So now what? Here’s an example. Say you’re making this outdoor storage bench out of 3/4″ plywood. 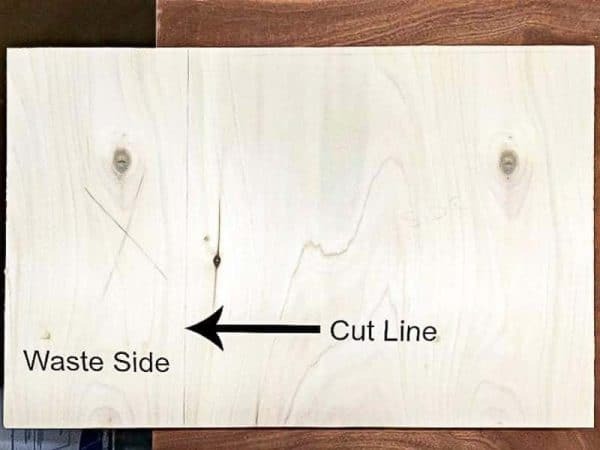 You’ve marked this particular piece with the line you need to cut, and an ‘X’ on the waste side of the board. Elevate the board with a few scrap blocks of 2×4 so you don’t cut into the worktable. Then place the jig on the cut line, making sure that the saw blade will be on the waste side. Clamp the jig to the board at both ends, and then the board to the worktable so it doesn’t move around mid-cut. Before tightening the clamps, double check that the corner will be square. Place a speed square at the cut line and adjust the circular saw jig if necessary. Finally, place the circular saw against the fence. Double check to make sure the clamps aren’t in the way of the saw motor, then make the cut. Be sure to keep the saw flat on the circular saw jig and slide it slowly along the edge. Ta da! A perfectly straight cut! Of course, a table saw would make this cut in a fraction of the time it takes to set up this circular saw jig. 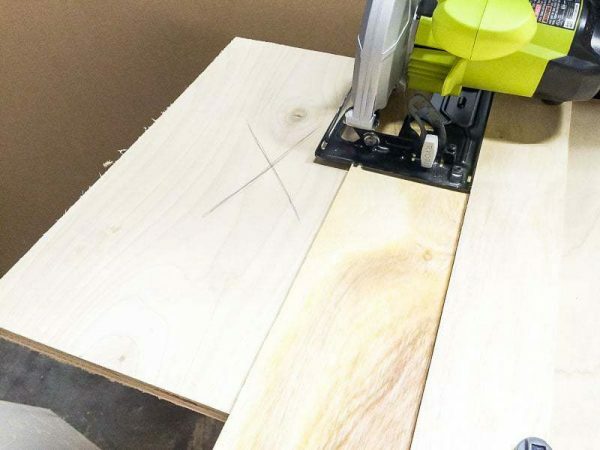 But for a beginner on a budget, this is the perfect way to cut sheets of plywood or even dimensional lumber! See, you don’t need lots of fancy tools to start woodworking! If you would like to keep up to date with my latest posts about woodworking, home improvement and more, you can follow me on Facebook, Pinterest, or sign up for my weekly newsletter below. Thanks CoCo! I still waste plenty of wood due to wrong measurements, but at least I don’t have to think about how to make the cuts straight anymore! This is going to be a VERY useful post! 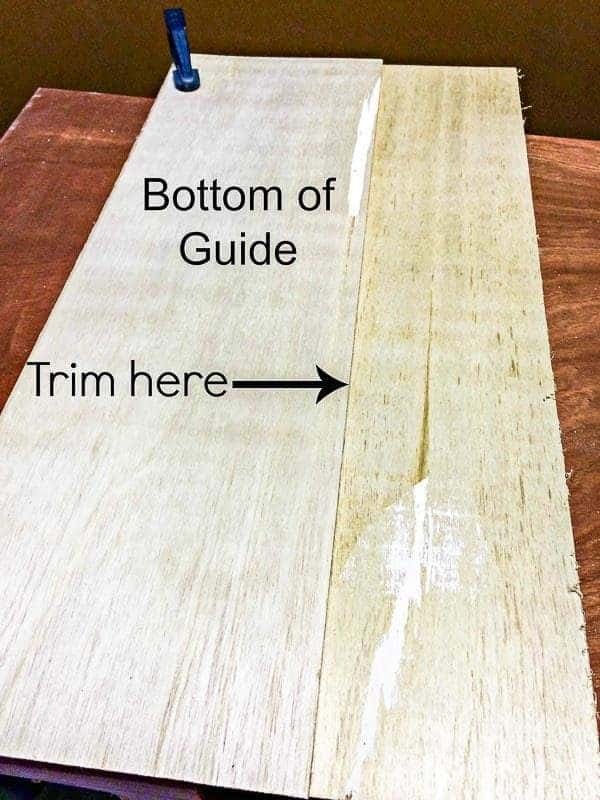 I have a long list of wood working projects I need to complete before winter comes around and I’m going to use your tips to cut those perfect lines! Good luck with your project list! Mine seems to keep growing. Thanks for sharing your experience. This DIY Circular Saw Guide is quite helpful. I want to buy some tools for my workshop. I’m still wavering between buying a circular saw and table saw. But my workshop is too small for a table saw so a circular saw is the best choice (with your DIY Circular Saw Guide). I had the same dilemma in my workshop, and the circular saw was the best choice for now. So glad I could help! The simplicity of your saw project is very smart! I am such an a rookie when it comes to power tools and since your project outlines so many specifics that make the process easy for me. I probably wouldn’t be the best critic of the work, but it proved an easy way to achieve the same cuts for my planter boxes. Thanks for the money saving information and creativity. I’m so glad my guide could help! Enjoy your planter boxes! Really glad this guide helped me, guys you gotta master the art ! Glad I could help, Rob! Here is another way. I like it because you can cut from either side of saw blade. Take about 16″ wide piece of plywood ( or whatever you want the bottom to be …om my first one i used a very thin quarter inch board and I’m regretting it ….although it is light and easy to work with. 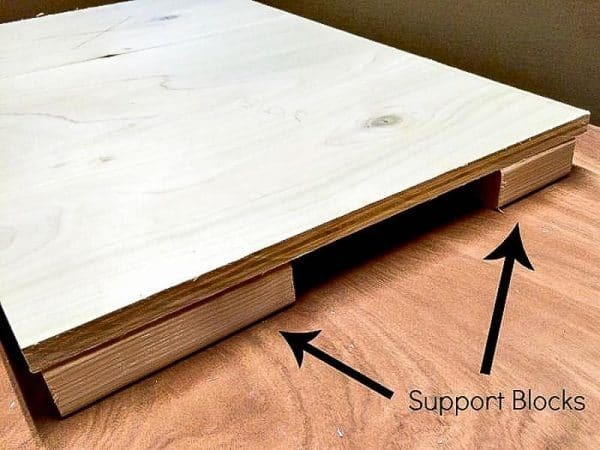 In the middle of that piece of plywood however long you want it to be ….place a piece of 4 inch or 3 inch wide white MDF board. The guy whose idea I used said that the MDF board is cut such that it is always perfectly straight and rarely warps or has issues. I believe it is also about 3/4 inch thick so that gives your saw edge a nice high surface to run against. Here’s the tricky part. now make sure the MDF board is perfectly square and straight on both sides and both ends. Mark it, with a pencil, on both sides, and then put glue down clapping and insert screws from the top…. Again checking to make sure it’s Square after you have set it down on the glue before you Clamp It. Once all that is done and dried then you take your saw and on one side you trim off using the right edge of your saw it on the other side you trim off using the left edge of your saw… for example on mine one side is about 5 inches wide and the other side is about 1 inch wide and in between those two is the MDF board so 5 + 4 + 1 is 10 wide total inches wide. 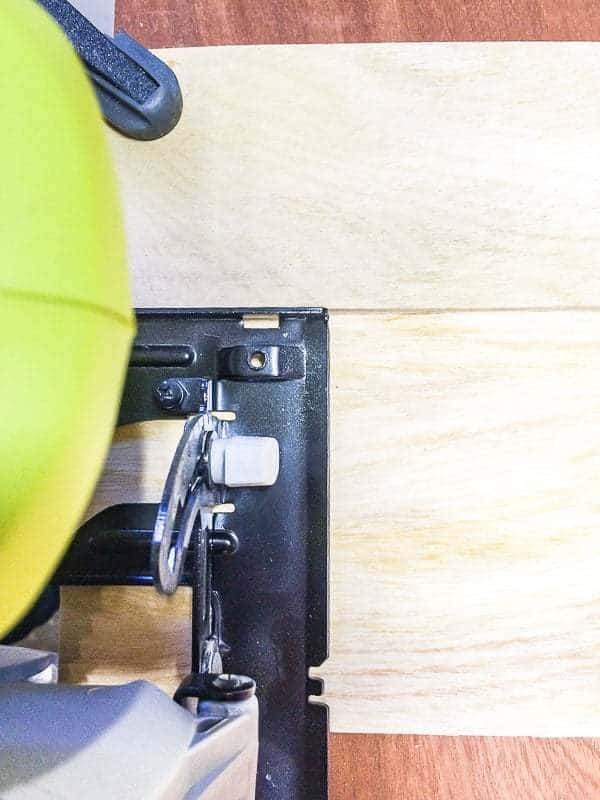 You can drill a hole in it to hang it up and you can also leave the MDF board on one side hanging off about a half inch so that you have a nice edge to go against when starting off….you pick up the edge early before you get to cutting the board. Wow, thanks for describing your set up, Chris! I have some scrap MDF boards left over from shelves I removed that I’ll have to try this on!